I love bangs – so the ‘80s were the right decade for me to have been living my teenage years. I spent much of my time back then ‘growing my bangs ‘. My ultimate goal was black or red dyed hair buzzed all around my head but sporting some bangs that hung over my left eye and touched my ankles. Unfortunately, I think they only ever reached as far as my chin. I still love bangs – but don’t feel the need for them to be modeled after Robert Smith from The Cure anymore. I know that many people (especially parents) don’t like bangs that partially hide one’s face. I could never quite figure out why MY bangs would bother another person. I loved being able to hide behind my hair – it made me feel secure and less exposed. I like that hair can do that – I wanted some part of me hidden from the constant scrutiny of society. 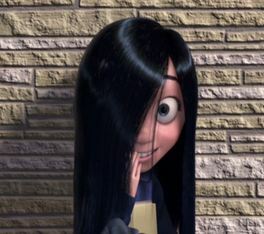 I really like the movie “The Incredibles” except for one part…Violet and her ‘after’ hair – I was especially fond of Violet BEFORE she decided to pull her hair back. She looked good- a bit mysterious, a bit coy…the guy noticed her. However, like most of my postings – this is not about deep philosophical thoughts…this is more in line with groin boils (Stephanie, if you are reading this – that was for you) and things of that nature. So without further ado – let’s get to the meat of this thing…. Humorous stories about bangs. When I was about 17 years old, I was working in my mom’s bagel shop, The Bagel Hearth. It was the summer before my senior year and my bangs were getting LONG. So obviously, having my ankle length bangs for my last year of high school was quite possibly an achievable goal. Mom informed me that my bangs were too long and I either had to trim them or do something to make them shorter so as not to include them in anyone’s baker’s dozen. I decided to perm them. So I went to my expensive hair-guy and he thought it would be really interesting to perm my bangs with Popsicle sticks. It sounded really cool. So I did it – I’ve always been of the opinion of ‘Why not? Hair grows back’…famous last words. My bangs looked like pubic hair. PUBIC FREAKIN’ HAIR. School was starting in 2 weeks and I have a head of pubic hair. Great. Thank GOD I’d already taken my senior picture. B) That my change of clothes was rolled up in a bag. I told her I was sure no one else was even bringing other ‘outfits’. I showed up at the photography studio in the MAUL – and much to my surprise I was completely WRONG. Many of my ‘schoolmates’ were there with multiple garment bags, curling irons, and make up KITS…. Really? For a senior picture? I liked pulling out my rolled up tee shirt and seeing the look of disgust in their eyes. I am far too lazy to ever bring costumes…and the picture turned out ok…I had to do the stupid ‘chair’ pose – which really only required me to be wearing a top. 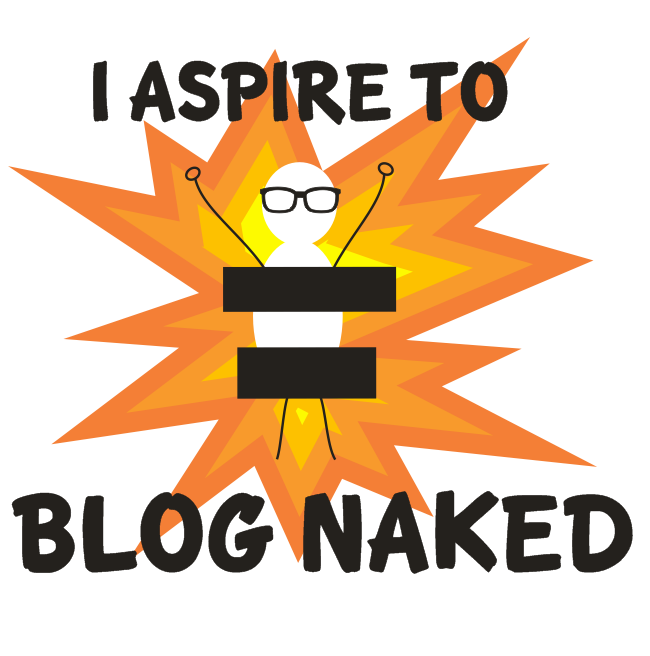 I could have been buck nekkid on the bottom and no one would have been the wiser. What a dork I was! Anyway- back to my pubic hair bangs. I’m not sure what to do with the pubic hair bangs –and I’m CERTAINLY not going to cut them off RIGHT BEFORE SCHOOL STARTS. So I take myself down to Sally’s Beauty Supply shop and look for something that will straighten this pubic-mess. And this is where things went horribly wrong. So I am rinsing out the relaxer and my bangs are nice and straight…they feel very silky soft…ah, I’m giddy with relief. Then I notice that my bangs are not drying at all…huh…I start to comb them out. I see huge clumps of bangs in the comb…I realize my I’ve F’d my hair up. ALL MY BANGS RELAXED RIGHT OFF MY HEAD…ALL. OF. THEM. I was devastated – I had to start the school year looking like J.I. Jane and not Robert Smith. I wrapped my head in a babushka for weeks. So I learned….READ THE PACKAGE. Right after my senior year I went to visit my super cool gay Uncle in Palm Springs. So, of course, I wanted to be stylin’ before the trip. At the time I was obsessed with having a white ‘skunk’ stripe going through my (regrown) bangs. Since the relaxer disaster I was a little fearful of stripping my hair by myself. So I went to have it done. Never, ever, ever go to discount salon to have your hair bleached. I should have known better than to go to a place that makes you pay to wash your hair. After the stylist burned my black hair to winter white, I (again) watched clumps of hair being combed out…and her comment? “Don’t worry, honey, it’s just a little breakage.” I had a BALD SPOT. Once when I was working at the Bagel Hearth (age 15), a woman and her 3 year old daughter came into the shop. The little girl took one look at me and started bawling. She was convinced I was missing an eye. I had to lift my bangs up and show her that I, indeed, had two eyes. My mom was convinced that I was going have eyesight problems because of my one-sided bangs. She made me go get an eye exam EVERY year from age 15-18. They were both fine. I actually had to start wearing glasses in my 20s. Not because of having long bangs in my eye – but because I’d spent so many hours reading and not looking up, that my eyes’ muscles no longer readjusted. See Mom, it was because I was a reading-NERD not a rebellious hair-freak, that I had ruined my eyes. And those are my stories! I'm a research librarian for Public Television, story teller, bike commuter, baker, music fiend, lover of reading & books, mother, wife, friend - and many more descriptive adjectives and nouns. This entry was posted in Childhood, Humor, Random Thoughts, Story and tagged bagels, bangs, hair, high school, Humor, salons, violet parr. Bookmark the permalink. And what great stories they were! You’re lucky you could wear black for your senior pic. We had to wear these fluffy white feather boa things. Sigh. Oh, I so looooooved The Cure. And I loved this post too! My friend and I stripped and dyed our hair once and we had no idea that dyed and viring hair would strip differently, so we ended up looking like calico cats. I kind of loved it…and I had many shades of orange – but I could see where maybe one wouldn’t want that! I have seen those fluffy white boa things…yes, sigh! Well, at least you didn’t have to share your senior photo shoot with your 2 year old brother (wearing color coordinated outfits, I might add). I admired your determination to grow your bangs. As soon as I got an inch of hair growth I felt compelled to hack it off. I loved the 80s! I almost mentioned that – and it was co-ordinated Xmas outfits, right? No, that was another time. These outfits were black and white and may have included suspenders. Ah – well, I’m not surprised that I might have a couple mis-memories!